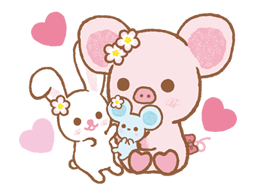 http://www.line-stickers.com/ – Piggy girl Line Sticker | Piggy girl is on LINE! She loves fashion, and always tries her best to be the cutest pig around! Piggy girl stickers round 2! Whether arguing or falling in love, these cute stickers will warm any girl’s heart. Copyright : © 2013 San-X Co., Ltd. All Rights Reserved.